Fresh, creamery butter. Is there anything more comforting? Points to all of you who can name the movie that quote comes from. (Hint: It’s one of my favorite rom-coms and stars the very pleasant to look at Hugh Jackman.) But to the rest of you, I’ll just go ahead and re-emphasize my point: fresh creamery butter is great, but it’s made even better by what you can have it with, or what you can add to it. I’ve always wanted to throw or at least take part in an Afternoon Tea get-together. I think it would be fun to gussy up and put out a whole Downton Abbey-style spread. I’m an absolute sucker for a tray or basket of baked goods so while I do like ginger and chamomile tea, for me the best part would definitely be getting to bake and enjoy all of the sweet/savory goodies that would be served alongside it. There’s nothing like watching Great British Bake-off for getting into the afternoon tea ‘spirit,’ if there even is such a thing. I love baking in general, but every time I watch an episode of Bake Off, I just want to get going on whatever challenge it is that I’ve just seen the bakers take on. Sometimes they’re complex recipes, and sometimes they’re deceptively simple (i.e. so simple, they’re simple to mess up). One of those recipes would definitely have to be the scone and I thought it would be a good post to do today considering the subject– because you just can’t have a proper tea without scones. If you’ve been following the blog for a while now, you know that this is far from my first hack at making scones, but it is the first time I’d made a proper English one. For a while I wasn’t aware that there was much of a difference between English ones and the ones I’d been used to making. Turns out that they differ in a few ways: first, they’re usually not as sweet as most other scones. They’re more supposed to be the vessel for sweeter condiments like jam or preserves. They’re also made with beaten eggs, which results in a more fluffy crumb than most flaky scones that depend only on butter and baking powder for leavening. The ingredients may be a bit different, but I still kept the method for making these almost identical to the method I use for making scones and biscuits–it’s just the way I get the best results. I did decide to give my proper English scones my own twist by first, adding a tad bit of vanilla to the dough, and second, adding orange zest and juice. Finally, because I did say that English scones are meant to be vessels for a flavored condiment, I also whipped up an easy condiment to pair with these: fresh creamery orange butter. Doesn’t it look delicious? And it couldn’t be easier to put together: butter, orange zest and orange marmalade. That’s it. I’ve gotta say y’all, I think I’d actually be brave enough to serve a platter of these scones up to Mary and Paul–I mean, I’d definitely still be scared, but I’m pleased enough with these so that I could do it without having a panic attack. They’re just really good. The orange in both the scones and butter is what makes such a difference. The texture of the scones is light and fluffy while the orange gives them such a fresh, clean flavor. (If lemon or lime is more to your liking, you could definitely swap out for either one with equally great results). I was frustrated at first because these didn’t rise as high as I wanted them to, but by the time I got around to eating one slathered with the butter I didn’t care anymore. Turns out, delicious food makes it hard for me to stay in a rotten mood. Cheers. Sharing at this week’s Fiesta Friday #212, co-hosted this week by Diann @ Of Goats and Greens and Antonia @ Zoale.com. Combine the flour, sugar, baking powder and orange zest together in a large bowl with a fork. Use the large holes on a box grater to grate the butter directly into the dry ingredients. In a small bowl combine the eggs and vanilla. Make a well in the center of the dry ingredients and pour in the egg mixture. Pour in the milk and orange juice. Gently stir together with a fork until the dough forms a somewhat homogenous mass. Sprinkle a clean work surface with flour. Line one or two baking sheets with parchment paper. Place a shallow pan of water on the bottom rack of the oven and preheat to 425°F. Turn out the dough onto the surface. Turn the dough out onto the surface and pat a few times with your hands until it loosely holds together. (Don’t knead it too much or the warmth in your palms will melt the butter and cause the scones to be tough.) Pat and roll the dough into a rectangle. Take the two opposite ends and fold them together like a business letter into thirds. Flip it upside down and pat & roll it into another rectangle, sprinkling the surface with flour if it gets too sticky. Repeat the folding process two to three more times before patting it into one final rectangle. Using a 2-inch cutter dipped in flour, stamp out rounds and place them on the prepared trays. Try not to twist the cutter; just press down and then lift up and push out the dough. Re-roll any remaining dough and cut out more scones. Place the sheet pan in the freezer for 15 minutes. Bake the scones for about 15 minutes until well risen and golden brown. Allow to cool for about 5 minutes before serving. 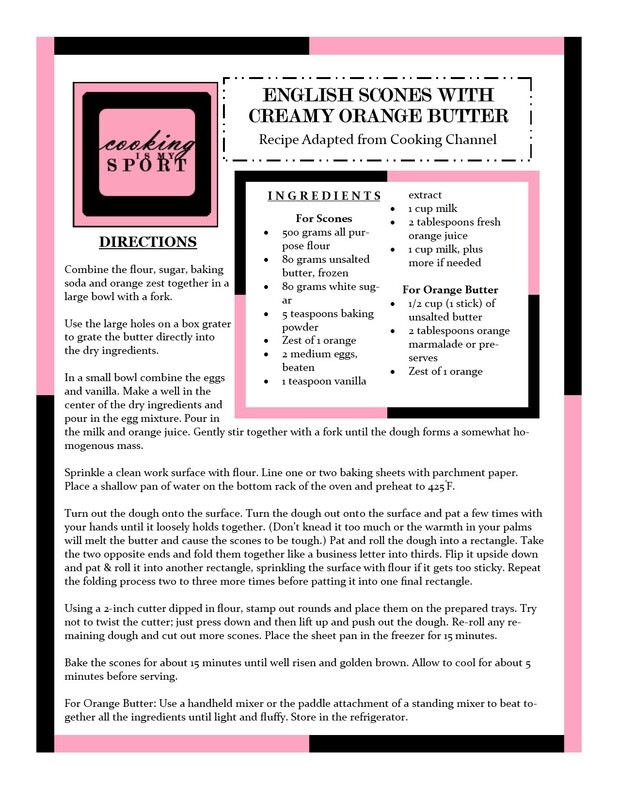 For Orange Butter: Use a handheld mixer or the paddle attachment of a standing mixer to beat together all the ingredients until light and fluffy. Store in the refrigerator. The creamy orange butter brings this deliciousness to the next level- YUM! It really does Josette, thank you! Me too, it’s a perfect breakfast. Thank you! Kate and Leopold…love that movie. High five to you for knowing what I’m talking about lol thank you! I love the orange butter with these scones…perfect! Love a good scone! 😊 And the orange is a great addition! I love that show. It always inspires me to bake too. Your scones are beautiful. Thanks for sharing over at Fiesta Friday! Jess, these look so good. Good scone recipes are hard to find and yours look excellent!! That butter! It kind of brought me back childhood with the little Pillsbury rolls that had the orange flavored icing! I mean there’s gonna be no comparison but it made me a little nostalgic! Please give measurements for the sconed. Liked to make your recipe but can’t. In your recipe you have baking powder in the list of ingredients but baking soda in the directions, which is correct? How many scones does this recipe yield. Thanks. Hi Debbie, that’s going to depend on the size of the cutter that you use. A 2 inch biscuit cutter should yield about 10-12 scones. Once the scones are made and put in the freeezer for the 15 minutes, can they be stored (frozen) until the next morning, and then baked? I’ve never tried that before Sherry, but I have heard of it being done before. You might want to wrap them individually in plastic wrap and foil once the dough is cut, then when you’re ready to bake, take them out as the oven is preheating, then bake. But like I said, I’ve never tried that before–that’s just my educated guess. Hope that helps answer your question.